This hour-long documentary is a provocative look at a historical event of which few Americans are aware. In mid-January, 1893, armed troops from the U.S.S Boston landed at Honolulu in support of a treasonous coup d’état against the constitutional sovereign of the Hawaiian Kingdom, Queen Lili‘uokalani. The event was described by U.S. President Grover Cleveland as an "act of war." Produced in association with the Center for Hawaiian Studies, University of Hawai’i. 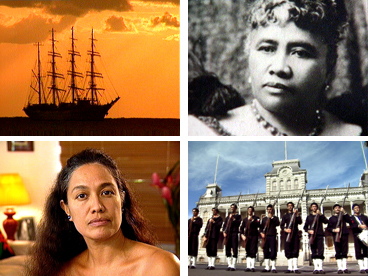 Featuring historians and scholars Haunani-Kay Trask, Lilikala Kame‘eleihiwa, Kekuni Blaisdell and Jonathan Kamakawiwoole Osorio. Act of War - The Overthrow of the Hawaiian Nation was one of the first productions funded by the fledgling Independent Television Service in late 1991 with supplemental funding from Native American Public Telecommunications, then called the Native American Public Broadcasting Consortium. It was broadcast on Hawai’i Public Television (PBS Hawai‘i) in 1993 during the centennial year observance of the U.S. armed invasion. In that same year, the U.S. Congress passed a joint resolution admitting the illegal taking of Hawai‘i and formally apologizing to the Hawaiian people who “never relinquished their claims to their inherent sovereignty as a people or over their national lands.” President Clinton signed the resolution in November of 1993. The program has since aired on over 93 public television stations and screened at 40 film festivals worldwide.